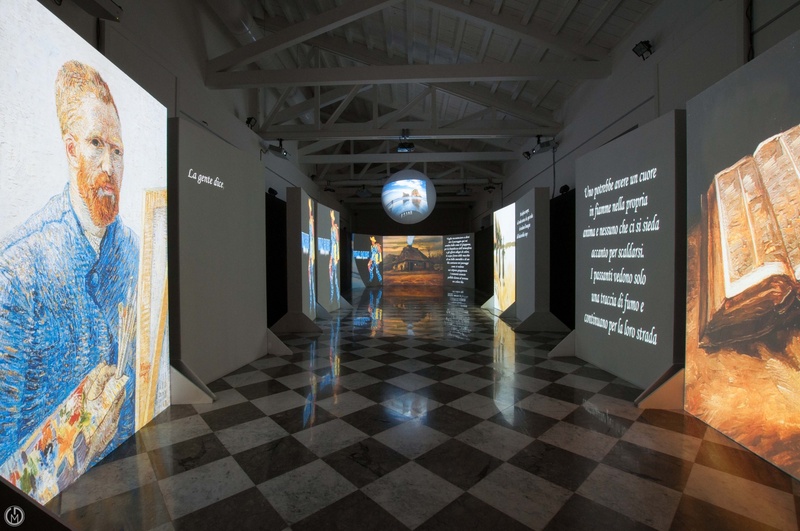 The increasingly frequent choice of presenting art to the general public through the use of advanced multimedia technologies allows us to amplify the communicative strength of the contents, using different transmission channels at the same time, the visual channel using images, the auditory channel using sounds and music, the sensorial channel using reconstructed objects and environments. 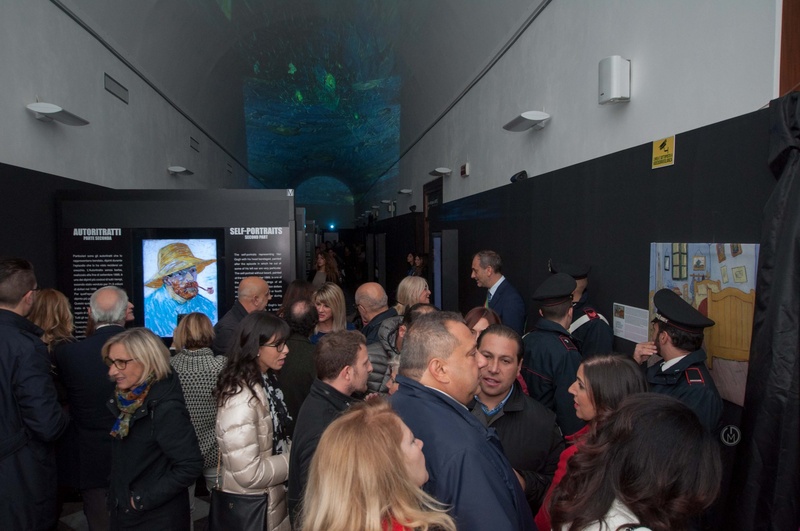 Through the use of various languages, the visitor is immersed in an enveloping journey, transported on a virtual odyssey to discover, in this case, the painter, the artist, the man Vincent Van Gogh. 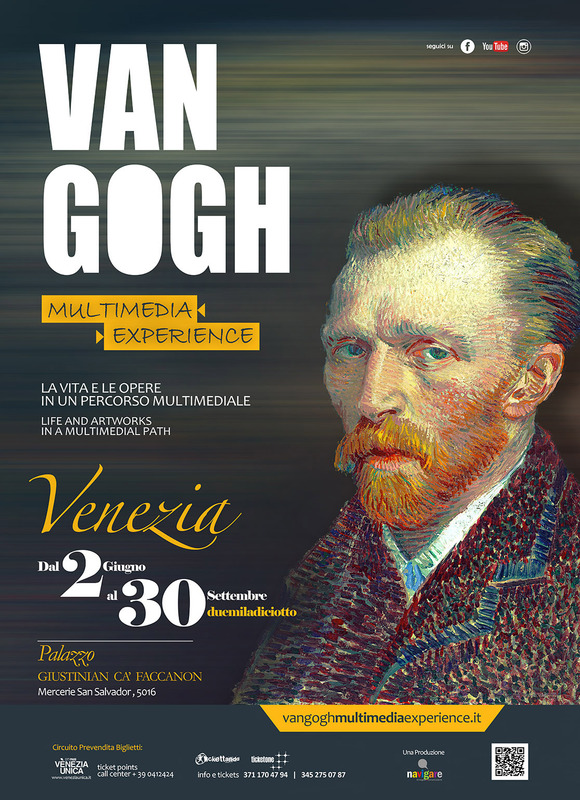 The multimedia exhibition examines, through projections on several large monitors, the life and works of the master, with video vision of many paintings and drawings made during his life and completed with some information in Italian and English relating to the artistic periods lived by Van Gogh during the last 10 years of his life. The thematic areas group the works according to the processing period, referring to the places where Van Gogh was and to some particular events of his life, together with some specific themes particularly loved by the artist. A full immersion between music and the fantastic colours of Vincent Van Gogh, this is the aim of the multimedia exhibition "Van Gogh multimedia experience", an itinerary that, between screens and totems, allows us to deepen our knowledge of the extraordinary creative activity of the author, one of the most important artists of the nineteenth century, increasingly appreciated both by contemporary critics and by art lovers. and repeatedly replicated with small variations. This is Vincent's bedroom in the «yellow house» of Arles, in the south of France, where the artist had taken refuge with hope to set up an atelier for painters of artistic avant-gardes. There are three versions of his pictorial work: the first one, today displayed in Amsterdam, was performed in October 1888 ; the subsequent ones are not simple repetitions, they are particularly interesting because Van Gogh painted them during his voluntary hospitalization at the asylum of Saint-Rémy-de-Provence, almost as if he wanted to recover and cling to happy memories of Arles. The reconstructed room tells the everyday life, the simplicity of Van Gogh, with the wooden bed, on the right, just put back in place after the night sleep. Behind the back of the bed there is a coat hanger on which we find some clothes of daily use and the famous straw hat with which Van Gogh had portrayed himself a year before, in 1887. On the wall next to the bed there is a portrait of a stranger and two Japanese prints, a genre that Vincent was quite passionate about. Then, on the back wall, a further painting is hung; this time a landscape. 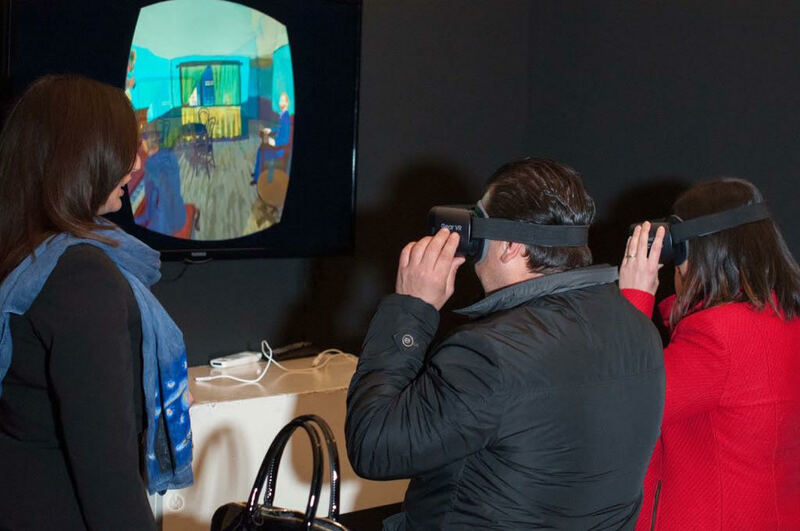 VR EXPERIENCE : a virtual reality experience with the Oculus Samsung Gear VR that for the first time is presented to the visitors in an exhibition dedicated to Van Gogh. The app allows you to enter the works of Van Gogh by perceiving three-dimensionally every figurative and chromatic detail. 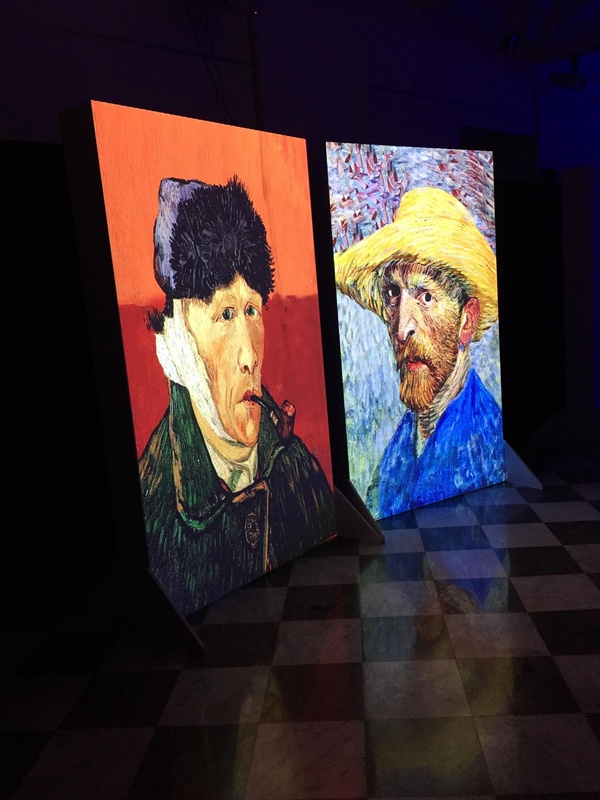 In the second part, entirely new and original, entitled "Vincent: the work of the soul" we find the great projections of some selected works, described by a narrative voice that punctuates part of Vincent's letters to his brother Theo. Accompanies the visitor through paths of study of the great works, but above all of the artist's personality, extremely sensitive, lover of coherence, resolute and determined to follow only his own inner law. Vincent Van Gogh, a painter beloved by the general public, has scored, on the artistic journey of humanity , a decisive turning point towards the relevance of colour, the extrapolation of the nature inherent in reality, the importance of the materiality of the brushstroke in the whole of the work of art. Yet the love for those who approach his works is towards the man Vincent who is hidden behind the enveloping vortex of a myriad of hues, inside the expressions of his characters of which we can fathom the soul, in boundless horizons on grassy plains and fields of golden wheat. I, Vincent - Collection of self-portraits in which the artist represents not only his external appearance but above all his feeling, his moods, his sufferings and joys of life. THE WORK OF MEN- itinerary through the work places of farmers and craftsmen that have fascinated the artist, who felt humanly close to fatigue and commitment of humble workers. THE MIRROR OF BEING- The portrait is the privileged instrument that Vincent uses to discover the most intimate personality and essence of his models, with the firm intention of making people's soul visible to others. THE FLOWERING OF THE LIFE - Flowers are the subjects of still life that most fascinate the painter, with the various possibilities of mixing colours , the combinations of colours and reflections, in order to expose what is the nature of things, which show themselves to us through the result of light beams of the visual spectrum that the artist analyses thoroughly. THE REFLECTION OF NATURE - Travel through the Dutch and French countryside, where Vincent often finds peace and refuge from the turbulence of life that sometimes drag him into insidious and dangerous vortices. The places of his inner stillness. ORIENTAL DREAM INFLUENCES - The man Vincent feels a strong attraction to the oriental universe that fascinates him for the sense of dreamlike peace and the possibility of travel not only physical but above all mental. Works that recall the oriental art. THE SOUL DARKNESS- Vincent's life has not been as generous as his death, for this reason he tries to discover and portray his suffering and that of others, who feel an affinity with him in a closeness of feelings. 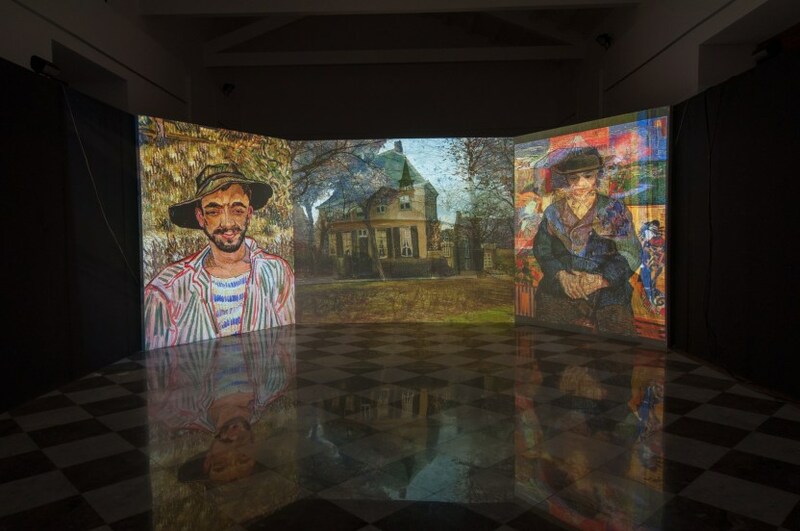 VINCENT PLACES - The extraordinary exhibition journey leads the audience through the artist's real places, then depicted in his works, in a comparison at the limit of the impossible between reality and dream. THE COLOURS OF SUNSET AND NIGHT - The night is the moment that fascinates more Van Gogh, when darkness envelops everything, obscuring the power of the sun but allowing the timid stars to shine in the power of all their beauty. The music that accompanies every moment of the exhibition itinerary, with the harmony of notes played from a piano, makes for a magic atmosphere, transporting the visitor towards a journey of knowledge, wrapping them in the swirl of colors cleverly combined in the artist's palette.